by Kelly Sallaway - LincsMag Writer. The Phoenix Open, a major golf tournament that kicks off the calendar year for Pro golf has a new look and new sponsor. 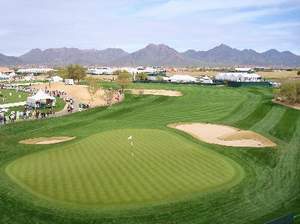 "The Waste Management Phoenix Open". The Open is one of the PGA's (Professional Golfer Association) most popular stops and is the best attended golf tournament of every calendar year. Last year it set a PGA Tour single day attendance record with over 170,000 fans, as well as a tournament week attendance record of over a half a million (538,356). Now it is sponsored by a garbage company. William Shakespeare asked “What’s in a name? That which we call a rose, by any other name would smell as sweet. So, Bill, what about a trashy golf tournament? We have the Staples Center (that's the office supply store) where the Los Angeles Basketball team play, countless airline and cell phone sponsors in our biggest sports venues. None of them have anything to do with the events per say. What they all have in common are billions of dollars changing hands for naming rights. I am not knocking the Waste Management people. They are a huge national company based in Phoenix and by rights a natural choice for title sponsor. But how many people are actually going to say " Hey, let's go watch some golf at the Waste Management Open" As in all sponsorship, most of the benefit is business-to-business related and not consumer oriented. 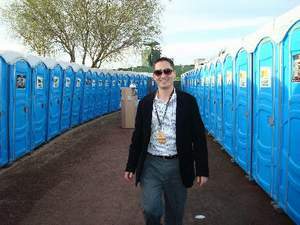 If the Open just got the cost of all the portable toilets the tournament organizers rent over a week it could equal a pretty hefty penny. Most likely, Waste Management had a shot at getting all the J-John business for the entire PGA. In marketing where the brand is everything is it really a good idea to have a title sponsor that instantly leads to jokes? Such as, "So and so golfer really stunk it up this weekend at the Waste Management Open." The Open is famous for an after-golf soiree that people already started calling the "Wasted Management" party. All sports and Pro Athletes do have their "trash talk" but that joke was just too easy. The correlation between Tiger Woods and Waste Management was better because " their career is in the dumpster"...and they are " both known for picking up trash". Jokes aside, in today's economy having a trash company as a sponsor actually seems like a smart move. 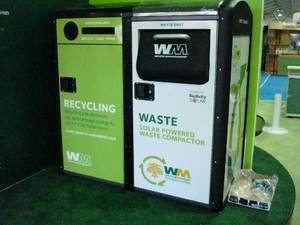 Waste collection is a recession-proof business. The Phoenix Open's last sponsor, FBR was a financial firm that managed to lose more than $1 billion in the past two years. Are English football players proud to wear jerseys with logos from other financially distressed companies like, AIG? Or would they just as soon be associated with rubbish removal? Sports teams are continually looking for innovative ways to increase sponsorships. Back when cigarette advertising got pulled from auto racing they found new money sources in software and Internet companies. They have become increasingly creative. NASCAR Sprint Cup cars now advertise candy, blockbuster film releases, Las Vegas headliners and sleazy Reality TV shows. If you have the philosophy that, "money is money" you probably wouldn't mind being the driver of the Viagra car. But would you want your stadium named for it? Does (the right amount of) money buy the rights to name anything? Would the public care if Wembley got renamed "Pepsi Field" as long as they were able to watch their favorite teams play? Not much is sacred when it comes to wrangling corporate funds and it's not just sports venue owners who are in on the act. The city of Indianapolis just signed a sponsorship deal with KFC Corp., the first step in an innovative attempt to defray costs for the city. Apparently, KFC will use images of iconic Kentucky Fried Chicken founder Colonel Harland Sanders with Indianapolis firefighters and city fire trucks to help market new products. It is a competitive world where creative financing and unorthodox sponsorships will continually be created by innovative marketers. If it takes an embarrassing name to keep a big event in business, people will go along with it. It's nothing new. If Faust made a deal today the story would have probably been similar but might have resulted in the "Satan Super Stadium".